Update | I have added a Reporting Finds page to this blogsite. The guidance has been adopted by the Prehistoric Society on their Facebook page as a new rule of engagement. 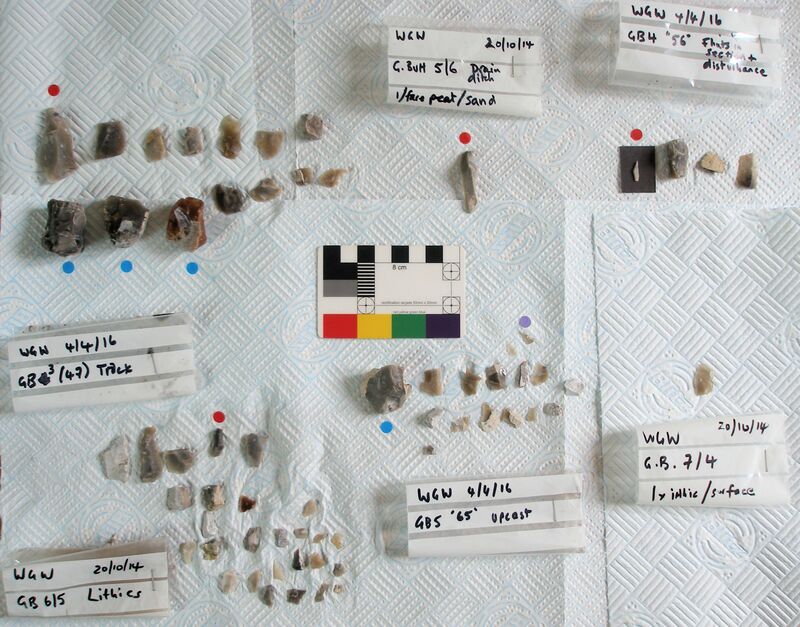 After last week’s post about a walkover survey of a Mesolithic landscape in Yorkshire, something I do annually with permissions—and about the persisting evidence of unrecorded flint collecting¹—I’m glad to say that just enough has been left behind since 2013-14² to be able to tell some kind of story. 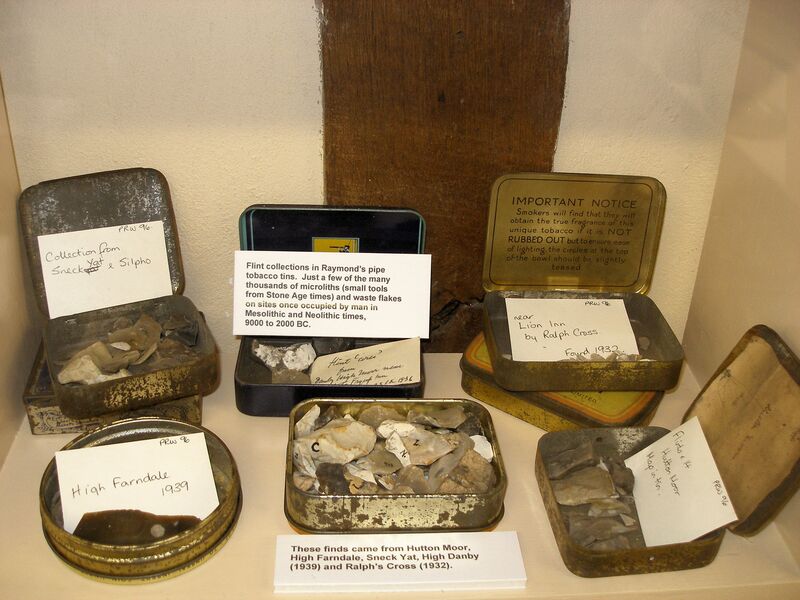 Stones tell stories—but context is key! The image here is rather rough-and-ready but shows, after gentle cleaning, 62 flints from the different disturbance locations, ahead of detailed analysis, cataloguing, HER submission, and archiving in a local museum. Very detailed grid references (GPS) have also been recorded. This is clearly a very small collection, but sits within a much larger archive, in the context of recent recording and volunteer regimes as part of a Historic England project, and the ongoing random activities of some participant(s) for their own various motives or habits. Burnt debitage indicating likely hearths. However, we don’t know what the collector(s) have removed, including any possible Early Mesolithic artefacts—which are extremely uncommon in this area and are usually broad-blade microliths (projectiles)—or indeed early Neolithic artefacts such as leaf-shaped arrowheads, attractive to collectors. We’re in an area where the Mesolithic-Neolithic transition (the overlap) hints at being potentially later than other northern locations. 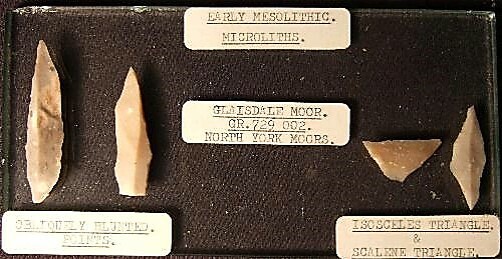 The image above was found on the Internet some years ago, posted under a pseudonym, and shows a collector’s Early Mesolithic microliths from Glaisdale. There were also images of microscalene triangles and backed bladelet forms. The area was frequently visited by collectors throughout the 20th century until recent work by Natural England to re-vegetate and re-wet an extensively eroded moorland area. The saddest news is that many 20th century collections, and very extensive collections amounting to tens-of-thousands of finds (if not more), ultimately ended up in land fills after the collectors’ deaths. Some ended up in museums, but mixed-up and not well documented, often the result ‘of a weekend walk’ over many years. There are a number of extensive private collections today, some known, many suspected, that may end up with a similar destiny—I know of at least four, filling garage-sized spaces that would take a generation to process. Even with recent developments in best-practice recording advice (PAS, HER, MoRPHE, CIfA and otherwise) by virtue of standards frameworks, an incredible amount of data—research data—remains out of reach, off-record and hence at risk. This is a Mesolithic landscape, or ‘taskscape’, a palimpsest, a persistent place returned to repeatedly for thousands of years. The lithic technology and a few diagnostic tools confirm a Late Mesolithic ‘narrow-blade’ date with activity extending a considerable distance, over 150m or more, across the moorland—dense deciduous woodland with clearances in the later Mesolithic climatic optimum—below a spring line, and farther downslope than previously recorded. My own recent radiocarbon age determinations (thirteen in all, from well-defined features) suggest discreet hearth-based knapping and tool manufacture/repair can span considerable date ranges even within a few metres of each other. The calibrated dates from a rescue excavation show activity around 5300-4800 cal BC (with possible re-use of a stone-ringed hearth together with a possible structure and ‘flat stone’ features) and perhaps even 3800-3770 cal BC (at least a discreet corylus burning event), and c.4300 cal BC elsewhere—these will all be published in due course. Our understanding of the palaeo-environmental prehistory of this area is much better researched and documented than the archaeology: see References in the previous post. There are also some suggestions, overall, for varying raw material procurement sources (over considerable distances), reduction stages and activities at different times and locations, although previous removals on a vast scale into the tens of thousands, when the area was much more eroded, will have compromised at least some of the surviving archaeological record. When legacy references and HER records talk to ‘an assemblage composed only of debitage’, one must wonder if that is true or a function of selective flint collecting along with other taphonomic (post-depositional) processes. Our record will always be a sample of a sample of a sample. I’ll post more, with images, when the analysis and cataloguing is complete. ¹ Evidence comprises regular sightings by the gamekeepers and farmers of at least one collector, the same gentleman each time (he used to quote my name as a legitimiser), known to leave small piles of debitage (taking the tools) and characteristic footprint patterns in all the eroding or disturbed areas where lithics are revealed. Some of his finds have been summarily recorded in the past but lack specific provenances in many cases. ² When the shooting butts and tracks were constructed. 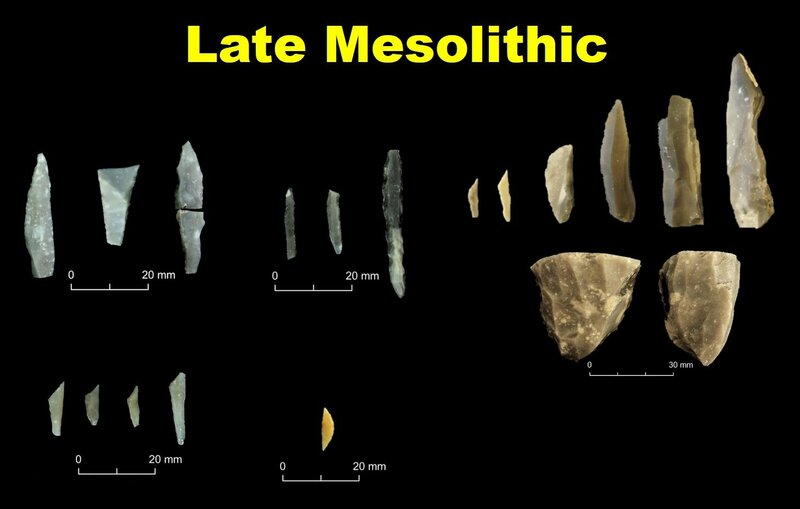 This entry was posted in British archaeology, Hunter-gatherer-fisher, Lithic analysis, Mesolithic and tagged Archaeology, Hunter-gatherers, Late Mesolithic, Lithics, Mesolithic, Prehistory, Yorkshire by Spencer Carter. Bookmark the permalink.